Last summer I felt lost. I met all kinds of people and spoke to them about all kinds of opportunities. I was worried about money and how to put together my career to date, with my loose ideas of where I wanted to be in the future. The two main pieces of advice I received were "do what you love and the money will come" and "try a few things on as you need to find out what works and what doesn't". Thank you Chris Brisley and Kevin Matthews. Today, Charley Radcliffe and I live in Chamonix, a dream we've had for a while to live in this place that inspires us so much. We work for ourselves on projects that we love and are interested in, and we aim to spend part of each day outdoors enjoying the mountains. Each day feels like winning and the money is coming. More and more opportunities are opening up to us around doing what we love; seeking adventures and challenges in the mountains and inspiring others to do the same. Some opportunities we make money from, others we don't but all are an investment in our futures. Last weekend we were invited to launch a new mountaineering product range for Salomon, the X ALP. 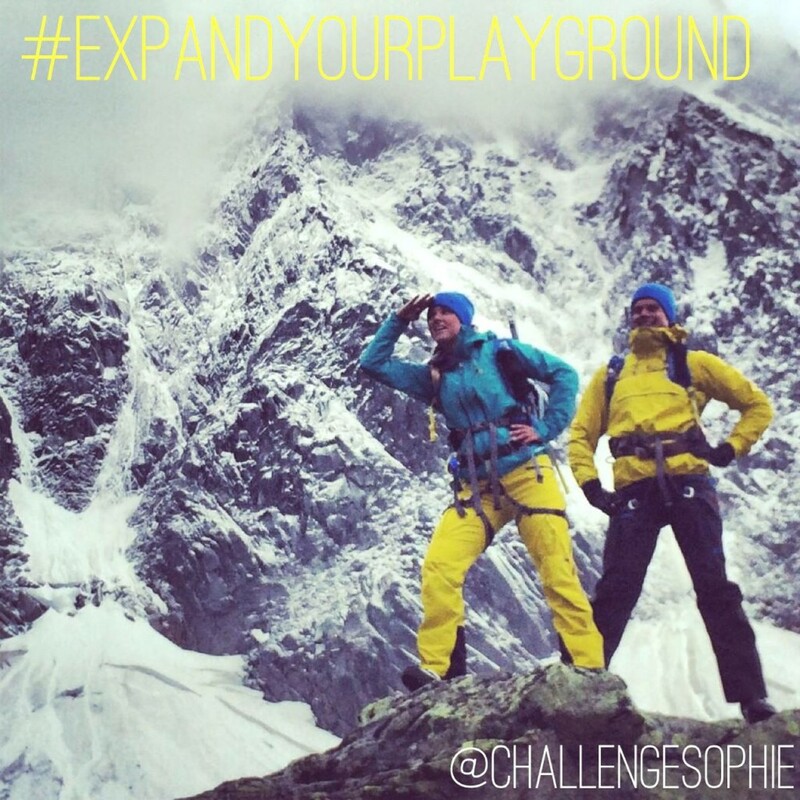 Between 5 bloggers we started a new hashtag #ExpandYourPlayground and created a buzz on Twitter and Instagram that reached 2.2 million people over two days. I think that's amazing! Talk about getting eyeballs! It was the first time Salomon had invited bloggers and social media influencers to an event like this, normally relying on traditional media and PR to spread the word. This was one of those opportunities that has come from doing what we love. This is one of those statements that get's banded around along with "follow your passions" and needs to be looked at in context. Whilst I'm a firm believer in doing work that you love, I'm also realistic about the limits of purely focusing on things that you love. I challenge myself to create the right balance between working on projects that pay and ones that don't. It's not easy to get paid to do the things you really love the most, but if you work at it and play the long game, of course it is possible. Keep growing, searching and expanding what you do across all areas of life and it will come. We all have choices we can make, even if we don't think we can, we really can. You guys write the rules for your own life! I don't know what's around the corner, but I've learnt not to care so much. It's what is happening today that matters. Every day I make choices and the more I make these choices the more I realise everything is going to be ok.
Not just ok, it's going to be freaking amazing! The way I work and live now has been a dream for many, many years. It's required a lot of faith, sacrifice and coming to dead ends to make it work, but it is happening right here right now. I believe that any of us can live our lives in any way we choose, but the first step is making that choice. Once you make the first choice to change the things you don't like about your life, the things that make you feel empty, uncreative or undervalued, you have to keep on making choices! It's ok if you don't know where you're going or what to do next, most people are figuring it out everyday, myself included! Challenge yourself to explore new opportunities, take leaps of faith and follow the scent of your passion to create a new path for yourself! This brings me back to Salomon and the opportunities that have come my way since doing what I love. Salomon wanted to land on the mountaineering scene with a bang. They explained to us that they didn't see the point in playing it safe, they wanted to create something no one else was doing, something that would get everyone talking. The gear is designed to take you from the top to the bottom of the mountain. For mountain enthusiasts who want to move quickly and freely in the mountains. For people who want to go for a weekend trip and explore different types of terrain and environment without having to carry multiple items of kit. For example, instead of carrying approach shoes and mountaineering boots, the new X ALP boots enable you to go from the start of the trail to the summit of the mountain with one shoe. You can wear them with crampons and everything. Genius. When I'm out in the hills I want to look good and wear kit that stands out. I want to feel comfortable and have flexibility in the gear I'm wearing so I can move freely and efficiently. Finally, I need to know my kit is going to withstand all conditions and hard use, to know that it's designed to keep me safe and warm. Definitely a tick on this front from Salomon! The bag is by far one of the coolest pieces of kit I've used. Every part of it has a specific purpose and I love that. It's designed so you can flip the bag round to your front and access the contents of your bag whilst on the move. Quick, easy and secure access! Brilliant. Tons of special gear loops and attachments to hook your rope, skis, ice axes, crampons and water bottle onto your bag, all in 20L! I cannot wait to take this climbing and give it a real test! During the 3 days I was with Salomon I learnt a huge amount about their brand. Everyone we met who worked there was not only excellent at what they do, they were passionate and hugely excited about this launch. They went bold with the X ALP product range and I respect that. Their promise to you and I is; to enjoy more of the mountains. Amen to that! Newer PostWhy do we fall off the wagon?